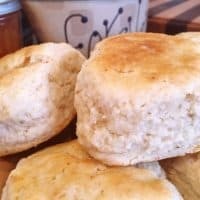 This recipe will make about 2 dozen biscuits! (Remember I said the birds at this Nest L.O.V.E. biscuits!) You can cut this recipe in half, with no problem! 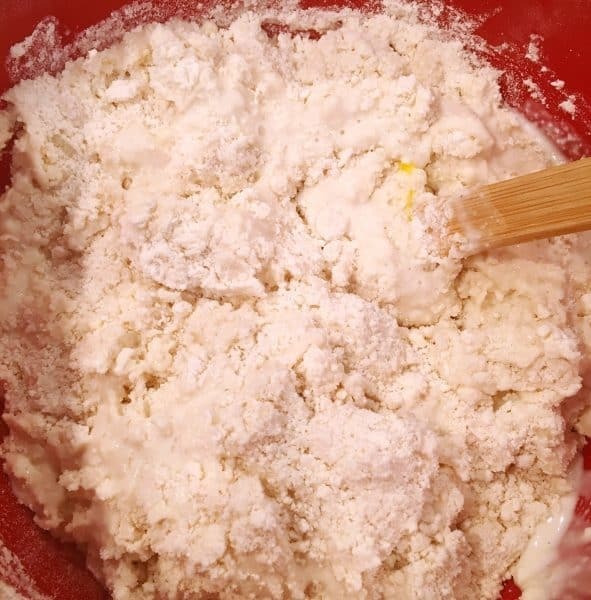 In a large bowl whisk together 4 cups of flour, 2 Tablespoons of Sugar, 2 Tablespoons baking powder,and 2 teaspoons salt. 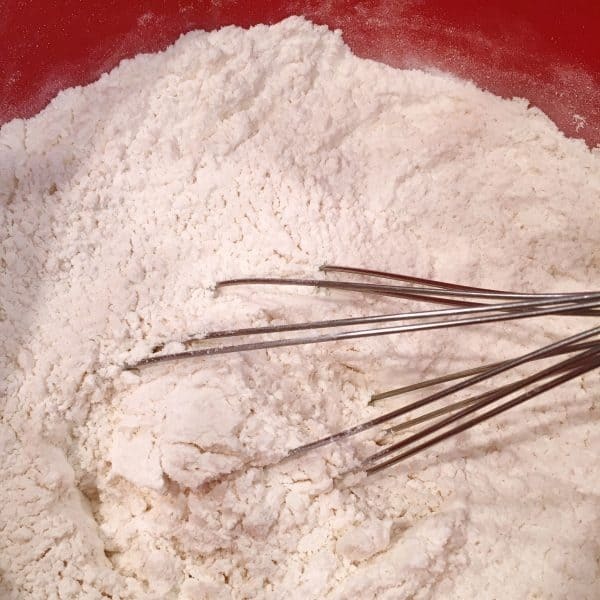 TIP: Using a wire whisk to mix the dry ingredients creates the same effect as “sifting” the dry ingredients. It will help create the fluffiest biscuit! I love to mix shortening and butter in this recipe. 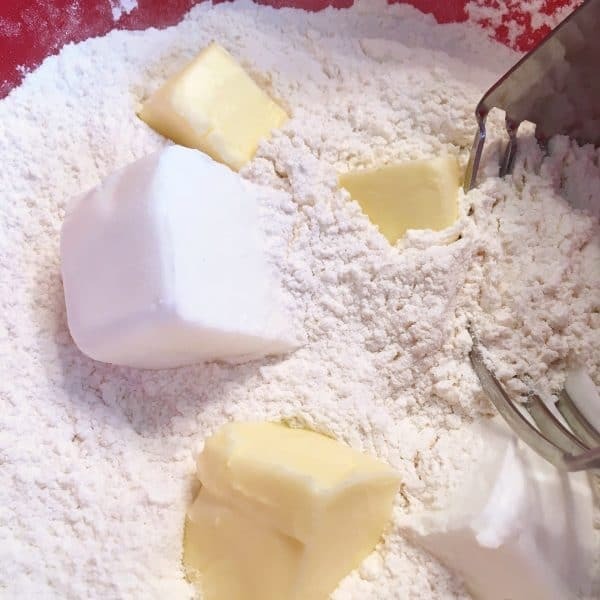 That being said…add 1/3 cup shortening and 1/3 cup cold butter pieces. TIP: Cut butter into smaller pieces. It makes it easier to cut into the flour. 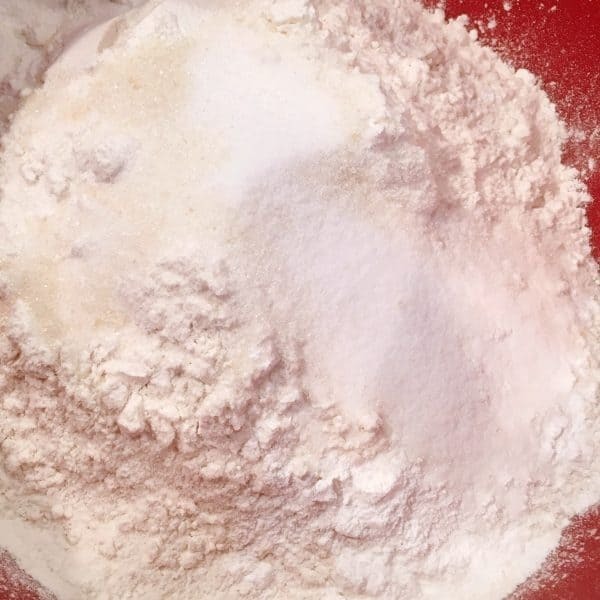 Cut butter and shortening into the flour until it resembles a coarse meal. Which reminds me…I am totally in love with my new Pastry Blender! In Love! It’s well made and a great deal for the money. It cut through the cold butter so smoothly! It can also chop nuts, cut eggs for egg salad, and mash-up avocados for guacamole among other things. 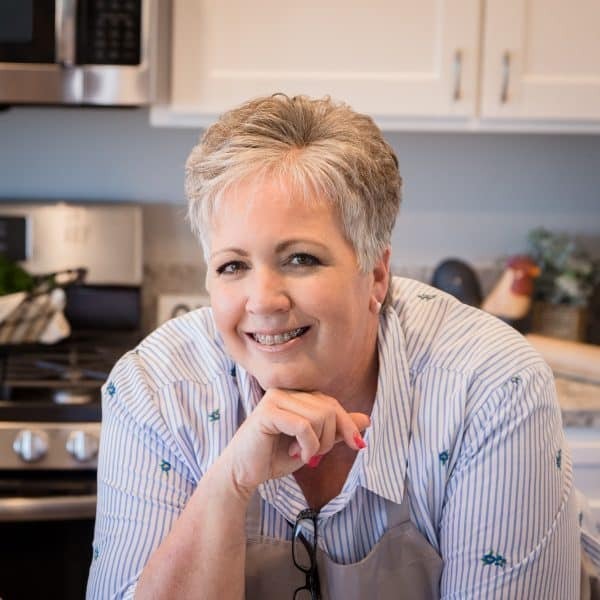 It’s my favorite new kitchen tool and I’ve included the link above and in my recipe card below! Make a well, or hole, in the center of the biscuit mix for the liquids. This is a great tip for mixing the wet with the dry. It makes it so much easier to blend the two together. Over mixing can make your biscuits tough! Pour 1 1/2 cups of milk and 1/2 cup of buttermilk into the well. Your dough will be wet and sticky. That’s perfect! 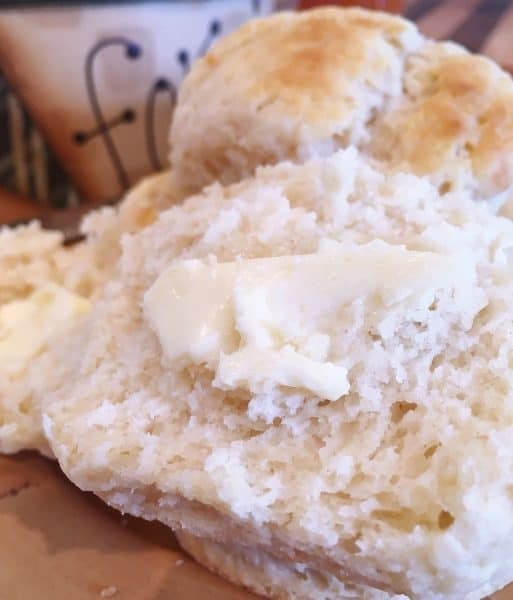 TIP: Truly for the BEST BISCUITS the less you handle the dough the better! Notice the dough is still wet and sticky and not perfectly blended. That’s exactly how you want your dough to look. Gently fold it over and press down. Knead it 5-8 times. That’s ALL! Pat the dough into a large circle about one inch thick. Don’t roll it. 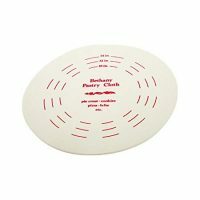 Just pat it gently into a circle…don’t take your frustrations out on it!. The dough should be at least an inch thick! Yep! That’s thick! We are making big thick fluffy biscuits. If you want Mamsy-Pamsy biscuits…you need to go knocking at another door! These are biscuits you can sink your teeth into and have yer eye’s roll back into yer head! 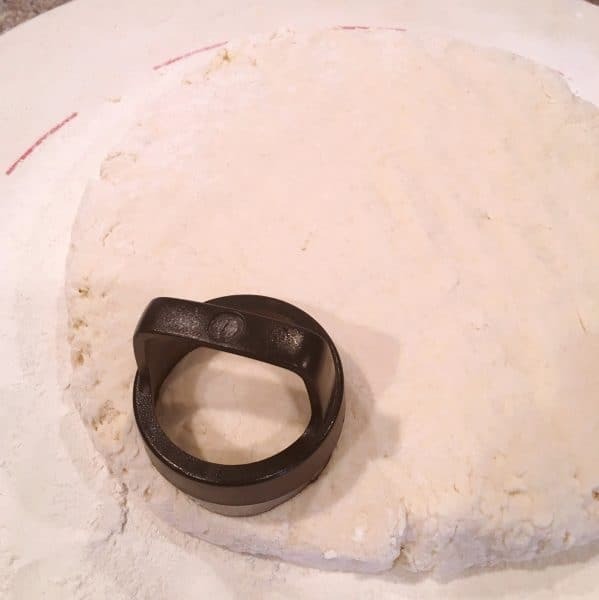 Using a biscuit cutter, OR a biscuit cutter masking as a “round cookie cutter” (I know…some of ya only use it to make those big thick sugar cookies with pink frosting! 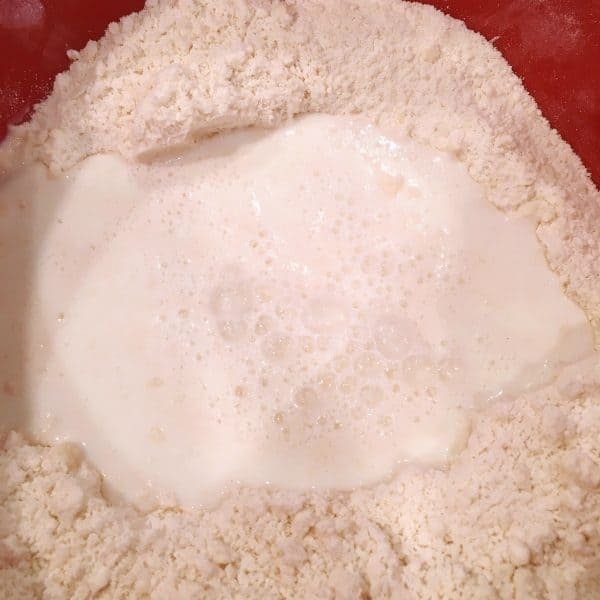 )… cut the biscuits out by dipping the cutter into flour first, then placing it as close to the edge of the dough as possible and pressing down. Repeat over and over, flour and cut, cutting each biscuit as close to the other as possible. TIP: If you don’t have a biscuit cutter you can use a juice glass turned upside down. Just be sure to flour it each time before cutting. Place cut biscuits, bumped up against each other, on baking sheet lined with parchment paper or silicone baking mat! Let’s Talk! 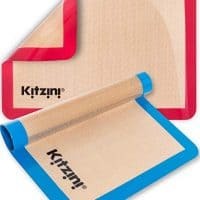 If you don’t have silicone baking mats…GET THEM! They are the best thing since sliced bread! I use mine ALL. THE. TIME! You can check them out HERE. They are worth every penny and they’re not expensive at all! Melt 2 Tablespoons of butter in a microwave safe bowl. 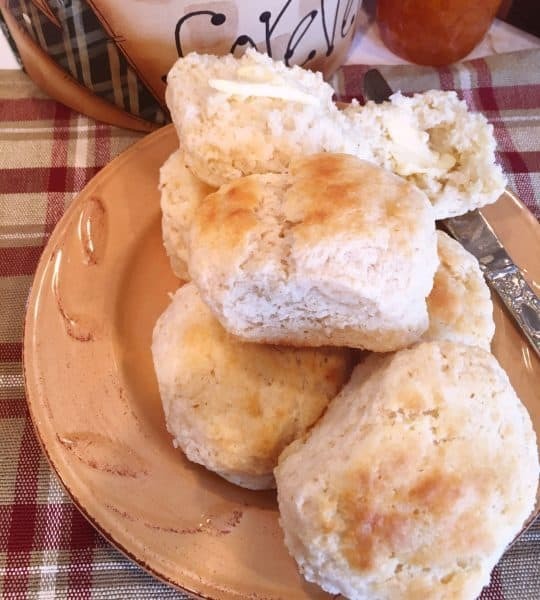 Brush each biscuit with butter. Oh yeah baby! It’s getting real now! Look at those babies…see how fluffy they are? The baking powder is already doing its thang! Bake 13-15 minutes until edges are golden. I placed mine under the broiler for minute to get the tops golden brown…but that was just for photography purposes. Generally speaking just let them bake until the edges are golden. You’re gonna flip when you see how high these biscuits rise! It’s like they’re reaching for the sky! They should double in size during baking. Isn’t that glorious! A truly beautiful biscuit! Remove from baking sheet…try not to burn your hands! (I’m obviously speaking from experience! Lots of Experience!) I want to pull them off the minute they pop out of the oven! Can ya blame me? Crack one open and watch the steam escape! They’re so tender and moist they melt in your mouth! Do you see all those air pockets? Those are little tiny spaces of happiness and joy that mean you’ve created the BEST biscuit on the Planet! They are so easy to make and such a favorite with family! The left overs make great breakfast sandwiches the next day…or midnight snacks…just sayin’! 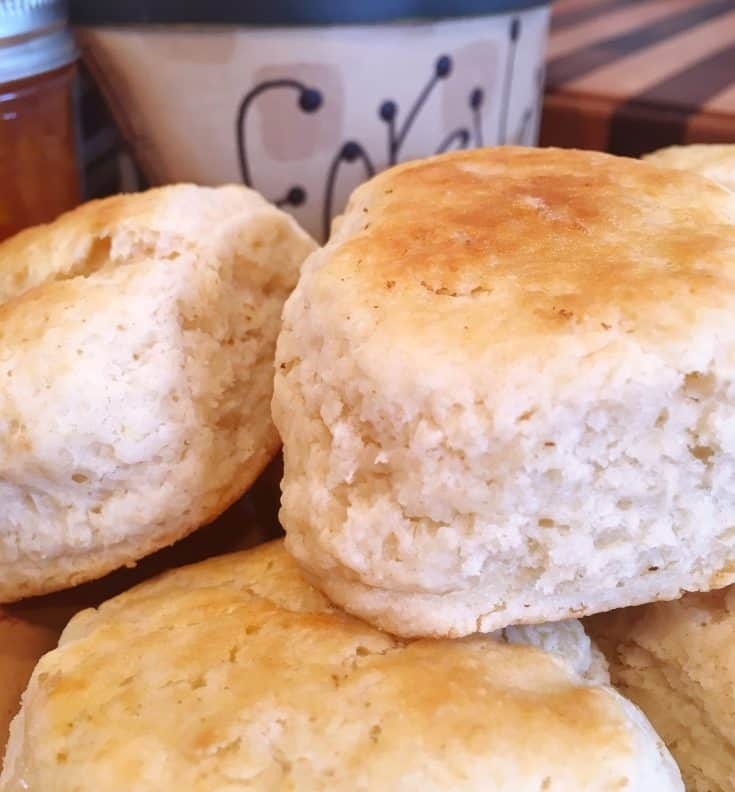 Let’s recap how to make the BEST biscuits EVER! Make sure you cut the butter and shortening in until it resembles a coarse meal. Handle the dough as little as possible. Only Knead 5-8 times. Pat the dough into a circle, don’t roll it. 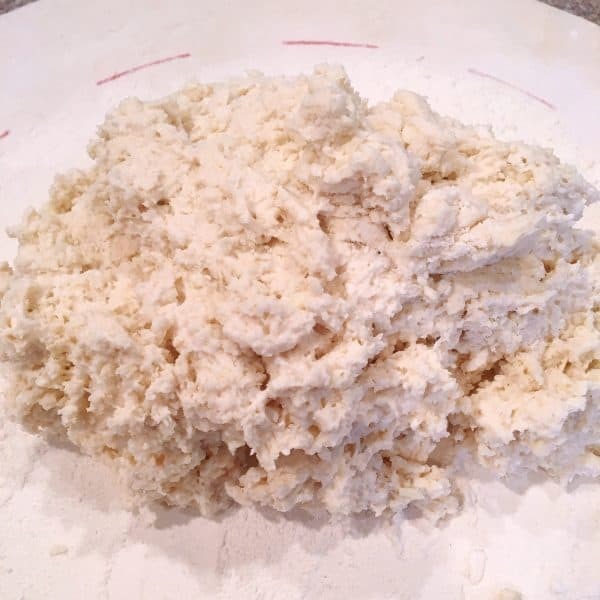 You can make the dough up ahead of time by turning dough out onto aluminum foil that been either floured, lightly buttered, or lightly sprayed with cooking spray. Roll up foil until sealed, and refrigerate up to 24 hours. Store leftovers in air tight container and re-heat in microwave. That’s all there is to it…easy-peasy! 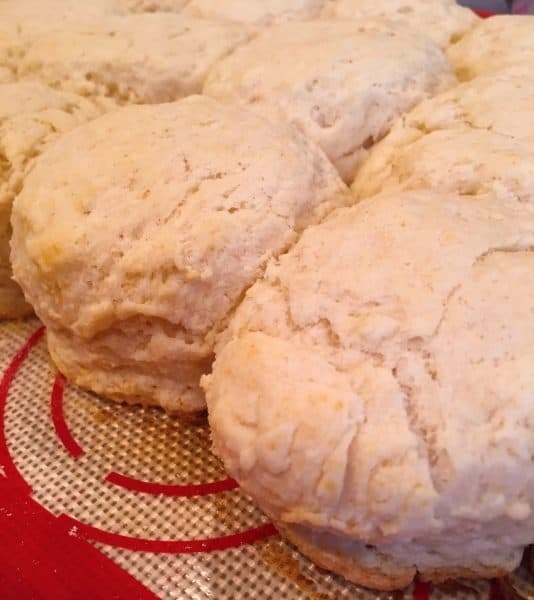 Truly amazing Homemade Baking Powder Biscuits! 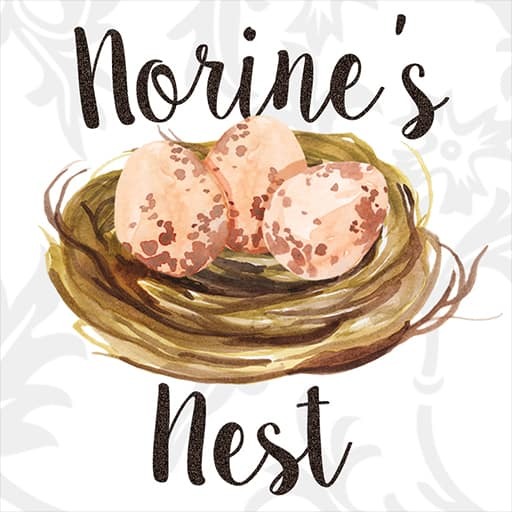 Remember you can always follow me on Pinterest, Facebook, and Instagram! I’d love to have you join me. 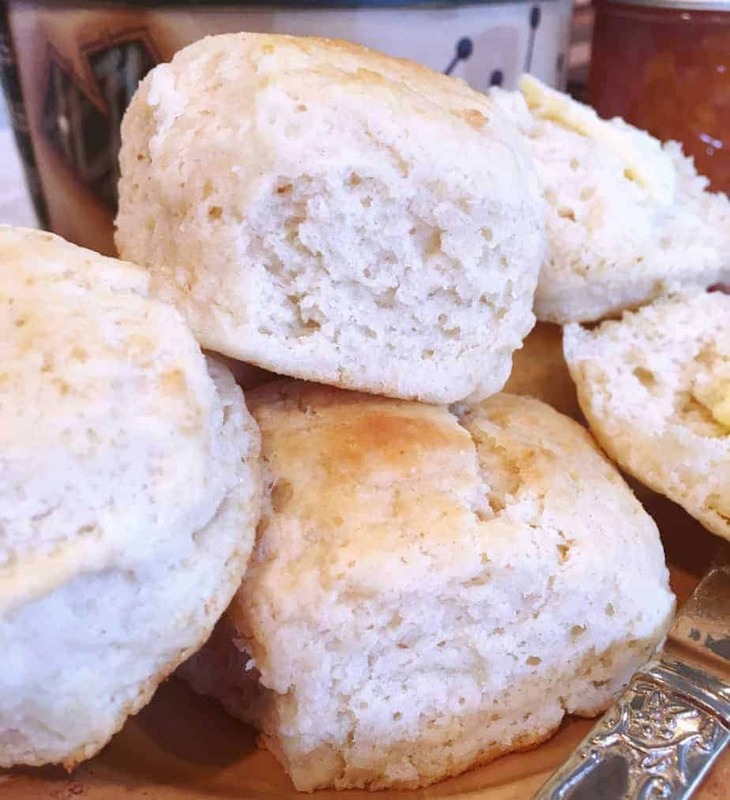 I’m sharing these delicious biscuits over on my Favorite Link Parties! Click on the Link to Join the Fun! Thanks for stopping by my Nest! Have a GREAT day! 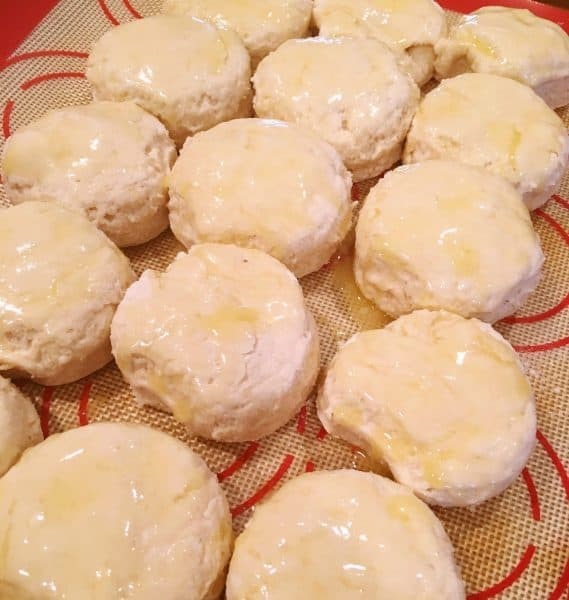 Tender tasty easy to make homemade baking powder biscuits. Cut in the shortening and butter until the mixture resembles coarse meal. Make a "well" in the center. Add milk and buttermilk. Stir gently until dough pulls away from the side of the bowl. Do NOT over mix. 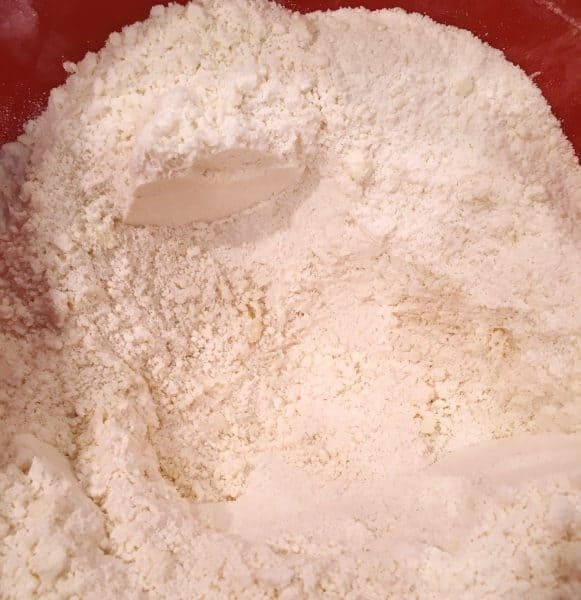 Turn out onto floured surface, and gently knead 5-8 times. Pat dough out to 1 inch thick. Cut biscuits with a large cutter or juice glass dipped in flour. Repeat until all the dough is used. 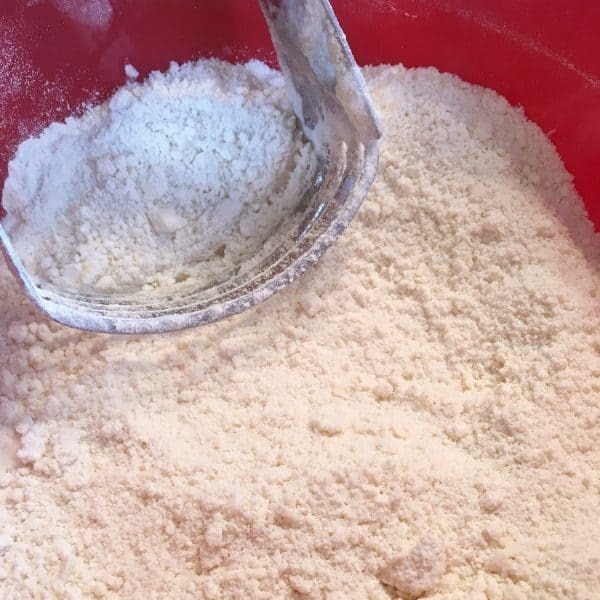 Brush off the excess flour. 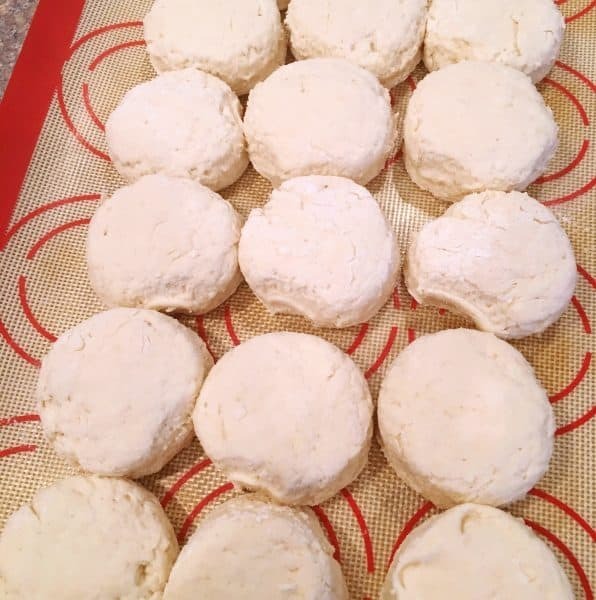 Place biscuits on lined baking sheet. Recipe can be cut in half and it can be made ahead of time wrapped tightly in sprayed foil, in the refrigerator up to 24 hour. These biscuits are so fluffy and beautiful! Thank you so much my sweet friend! 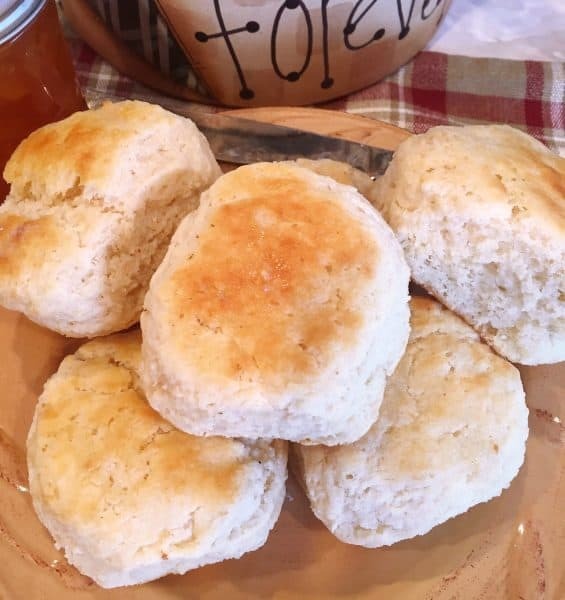 I love this biscuit recipe…course I love biscuits! I must have some unknown southern blood in my genes! 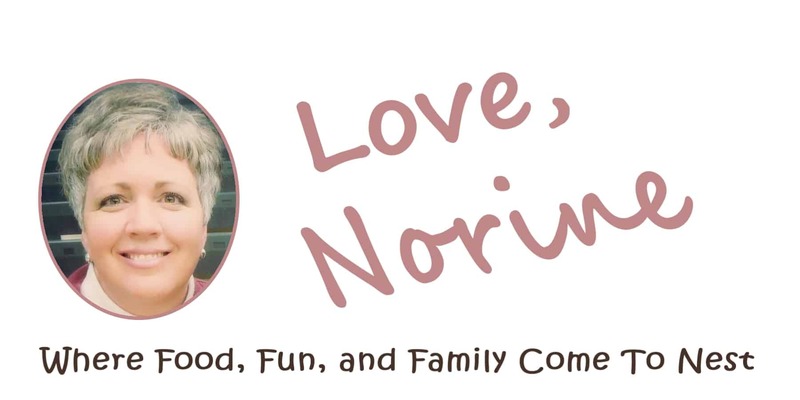 Hi Norine-Love your posts! Very entertaining! My biscuits are really good…but these sound GREAT! BTW, I use my mom’s pastry blender & her cutter, which is…a cut-off can! 😉 Works great! Thanks so much! Can I just tell you how much I love the “cut-off” can tip!!! What an awesome idea and I would have NEVER thought of that! I’m going to pass that along to my followers! Such a great idea. Thanks for sharing with me. I hope you have great weekend! Stop by again and visit! Love hearing from fellow biscuit lovers!